What is Asset Organizer Pro? Asset Organizer Pro by Primasoft is a flexible asset management software that provides Windows users with tools to easily catalog, manage, and track a company’s fixed assets. The technology boasts of an intuitive interface which present a variety of solutions that are easy to set up and roll out. A full database template allows users to maintain and organize asset information of manufacturers and vendors. Maintenance tasks such as repairs and relocations can be easily monitored. For loan log, Asset Organizer Pro’s database works alongside the program’s check-in and check-out transaction. The system also has a separate Designer module that can modify and customize asset solutions. Primasoft Software designed Asset Organizer Pro to be easy-to-use and highly functional. Ready-to-use templates are presented in an intuitive interface, which allows users to manage assets, inventories, possessions without having to start from scratch. Users can rapidly access assets and inventories data in a variety of ways: Table Viewer presents data in rows and columns, Browser Viewer displays data in virtually any way, and Standard Record Viewers allows users to easily enter and modify assets and inventories data. Specific commands can also be generated to speed up processes in order to get more work done at the fraction of the time it usually takes. Asset Organizer Pro has a Report Wizard, Label Wizard, and HTML Generator Wizard that helps users create professional looking documents, asset item reports, summaries, Web pages and asset item catalogs. These can even be customized with color and graphics, in order to represent a brand more effectively. Organizations do not need to repeatedly invest and orient on separate fixed assets management software. Asset Organizer Pro addresses all database needs and comes with a Solution Center for Business and Home. Users can save time organizing their records as Asset Organizer Pro has productivity tools to aid in time-consuming tasks or repetitive processes. These can even be saved to templates so that repeat workflows can be automated. If you are considering Asset Organizer Pro it could also be beneficial to examine other subcategories of Best Fixed Asset Management Software collected in our database of B2B software reviews. Since each organization has particular business wants, it is advisable for them to refrain from looking for a one-size-fits-all perfect software system. Needless to say, it would be useless to try to find such a platform even among widely used software applications. The intelligent thing to do would be to list the various vital factors that need consideration such as required features, finances, skill levels of staff members, company size etc. Then, you should do your research thoroughly. 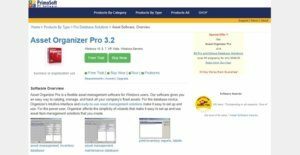 Read some Asset Organizer Pro reviews and investigate each of the other systems in your shortlist in detail. Such comprehensive research can make certain you reject ill-fitting platforms and choose the system that presents all the aspects you require for business success. How Much Does Asset Organizer Pro Cost? We realize that when you make a decision to buy Fixed Asset Management Software it’s important not only to see how experts evaluate it in their reviews, but also to find out if the real people and companies that buy it are actually satisfied with the product. That’s why we’ve created our behavior-based Customer Satisfaction Algorithm™ that gathers customer reviews, comments and Asset Organizer Pro reviews across a wide range of social media sites. The data is then presented in an easy to digest form showing how many people had positive and negative experience with Asset Organizer Pro. With that information at hand you should be equipped to make an informed buying decision that you won’t regret. What are Asset Organizer Pro pricing details? What integrations are available for Asset Organizer Pro? There is no information available on Asset Organizer Pro’s third-party integrations. If you need more information about Asset Organizer Pro or you simply have a question let us know what you need and we’ll forward your request directly to the vendor.